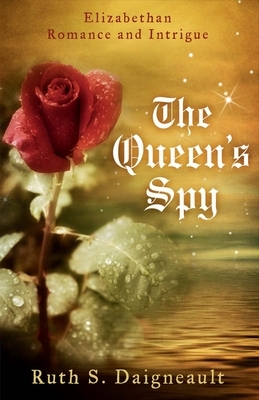 The Queen's Spy is an historical romance novel set in England during the years prior to, during and after the Spanish Armada. This is a time of great unrest where Protestant and Catholic factions are at odds over the throne of England. Philip of Spain, smouldering at Queen Elizabeth's rebuff of his advances, has determined to conquer England and return the country to its Catholic faith. Spies from both sides are abundant, and this novel deals with the an English spy, cousin of Sir Francis Drake. Jeremy Hawkins, crippled as a youth, leaves his sister behind when he takes up his position as a spy for Queen Elizabeth I. Catherine Hawkins, a spunky young lady, remains at the ancestral home, Hawkesbury Manor. Their cousin Mary has come to keep her company while Jeremy is away, but her activities set up a chain of events that no one could possibly have anticipated. Ruth Daigneault has been writing since childhood and is a published author of The 13th Guest, co-author of The Last Journey - Going Home with Paul Daigneault. Ruth wrote a series of whodunnit vignettes featuring the ‘murder' of local celebrities, the ‘suspects' and the solution. Farley Mowat was one of the ‘victims' and told her the stories were excellent. Fifteen of her mystery-comedy dinner theatre plays have been performed in several cities across Ontario. Ruth and her husband live in Port Hope, Ontario.